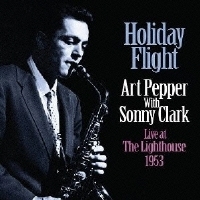 Description: Art Pepper joined this jam session at The Lighthouse in Hermosa Bea ch, California on the night of March 30, 1953. In the middle of the session, Art was asked to take the lead, with Harry Babasin on bass and Bobby White on drums. But regular session pianist Hampton Hawes hadn't shown up that night and Art didn't feel comfortable without a piano. Sonny Clark, in the audience that evening, was urged to go onstage to play. This accidental session is historic, in that it is the only performance of Art and Sonny together. Recorded live at The Lighthouse, Hermosa Beach, CA on March 30, 1953. Mono. This reissue CD was released in Japan by SSJ Records in 2013.